I didn’t have it right. 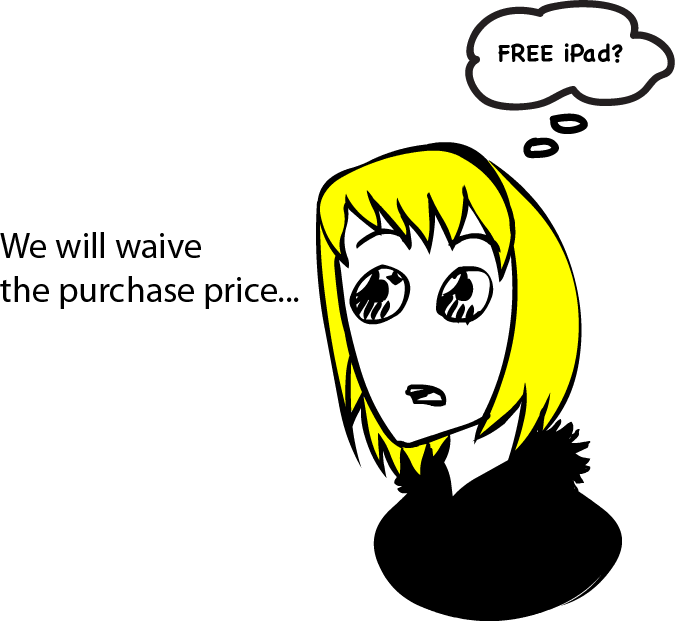 He was using the term “purchase price” to describe an extra payment at the end of the two-year term to allow me to “purchase” the two-year-old iPad. Darn. Similar confusion arises when common terms are used in specialized ways within a discipline. Statistics and Operations Research have plenty of confusing specialised language. A Google search on “confusing statistical terms” uncovers a goldmine. “Significant”, “Random, “Regression” and “Normal” have common meanings quite distinct from their technical meaning. “Linear Programming”, though not a term in common use, implies programming, probably in a linear fashion, which does nothing to aid comprehension. There are problems with the term “problem” and even greater problems with the word “solution.” In Operations Research a solution is nothing like an everyday solution. It doesn’t even have to be possible! Sometimes, like my friendly salesman, we can forget how confusing these terms are. And not only are the terms confusing, but they are sticky. The students have lived their lives with one vague meaning for random, so it will take many attempts to internalize a different meaning. Here are some thoughts on how to address the problem when teaching. A comprehension problem could stem from misunderstanding of language, like my communication problem with the loan clerk. Say to students – “Whatever meaning you have for ‘random’, you need to put it to one side when we are talking about random in this discipline.” Get them to explain what it means to them, and explain what it means in the discipline. Find similarities and differences. When talking about significance in statistics, I try to call it “statistical significance”, which is a reminder that it means something different from the everyday (and newspaper) use of significant. Students learn best what is tested. Have questions about statistical language that separate out the meaning of the term from the statistical concept. A student could say that a sample contains probable bias, by being confused about the term and the application of the phenomenon and the two errors cancel out, giving them a correct answer. Give examples of the terms used in the “everyday” way and in the specialized way for them to sort. Give students opportunities to use the terms in their speaking and writing. Students to identify whenever there is a conflict between everyday use and statistical use – make their own list like the one below. Compared to the challenge of helping students comprehend inference, the language issue is a small one. But unless it is dealt with, it can be a barrier to the complex ideas. And I did get the iPad. For business use of course! To make things even worse, the word error has two different meanings depending on context. A type 1 or 2 error is a probability. An error is the difference between an observed and a fitted value in a model. We then add more complexity by having two versions of some concepts, one denoted by Greek letters (a theoretical or unknown value), the other denoted by Roman letters (the observed or measured value). No wonder statistics is such a difficult subject. In my experience (of working with applied scientists of various persuasions) we spend far too much time teaching the mathematics underlying statistics, how to do a t-test etc., and not nearly enough time explaining the underlying concepts and how the jargon words aid communication. Thanks for that comment. The word “error” is definitely a problem. I totally agree about more time on concepts and language.